Kurganstalmost is on its way to become one of the top steel fabricators in Russia. Applying advanced methods has enabled the company to move on from bridges to providing tubular steel structures for major stadiums of international sport events. 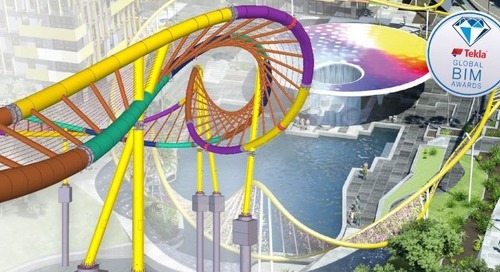 Their unique advantage is the connection between Building Information Modeling and CNC cutting software that produces ready-to-weld parts of complex tubular structures directly from the model. 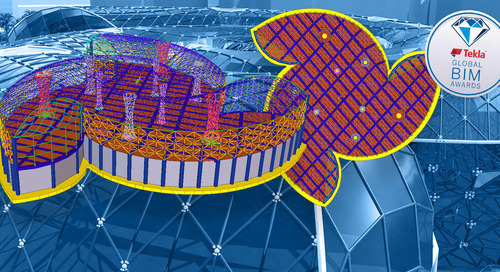 "When we got the request to design and fabricate steel structures for the Fisht Olympic Stadium in Sochi, we realized that we cannot manage with the tools we've used before," says chief project engineer Konstantin Raznoglyadov of Mosproekt OAO, part of the group of companies including Kurganstalmost JSC. "This was a new task that required dealing with much more complex objects than before. By using Tekla and HGG software, we've made a quantum leap forward in our business. Prior to BIM with our pipe-cutting machinery, we simply did not take on such complex objects." Kurganstalmost used to specialize in bridges, but has since provided the steel structures for four out of five stadiums of the football world cup 2018 in Russia. With modern know-how and progressive design developments and technologies, the company has increased its fabrication process efficiency and guaranteed an output that corresponds to current quality, reliability and durability standards. In combination with Tekla BIM software they use HGG pipe cutting machinery to effectively cut the 3D profiles on pipes. In addition to stadiums, the company is now able to tackle architectonically challenging bridge projects, too. They model everything up to the welds, which provides major benefits in production. 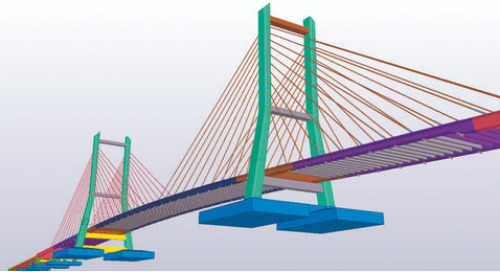 Tekla models are information-rich, including much more information than just the geometry. All model data created in Tekla is transferred to HGG 3D Profiling equipment via HGG’s postprocessor ProCAM software. The link works seamlessly, which allows easy-to-use, fast, accurate and actual fabrication data. Increased automation is a great benefit for any fabricating firm, helping to avoid human errors and delays in schedules and to keep track of design and construction changes. BIM combined with HGG pipe cutting machinery allows Kurganstalmost to accept challenging projects at all times. “Since the objects are so complex and large-scale, there are always several people involved in one project, but there are not many requests for information. From the very first moment we start modeling with Tekla Structures, we only work in multi-user mode. Our fabricators also use Trimble Total Station for control assemblies, assemblies of existing fabricated components. We also deliver models to the construction site where the erection crew assembles all components. This is an absolute must in today's business because it eliminates most of the mistakes," Konstantin Raznoglyadov says. "We are number one in Russia by volume of steel constructions per year and in the CIS segment of bridge construction," says Stanislav Ryabchenko, head of Kurganstalmost's marketing and sales department. "For the last four years it has mostly been about large-scale stadiums, including the stadiums for the 2018 soccer games in Russia. We place great importance on the quality of our products, for which we have both quality and technical control systems for bridge inspection. Participation in big projects requires, and creates, certain synergy for which we need to employ various professionals. We see a union of strong players, such as Tekla and HGG, among the elements of our success." "We recently signed the contract for the Samara Stadium of 45,000 seats. Its uniqueness lies in there being no roof but a type of dome that covers the bowl and visitor facilities of the stadium. The project is very big, consisting of 13,500 pipe constructions. We could complete our sixth deal thanks to our experience with five stadiums: Sochi, Fisht, Spartak, Zenith and Krasnodar. After Samara, we have another project signed in Rostov-on-Don. So, Kurganstalmost is a key player in the realization of roofs to the stadiums of the 2018 games." 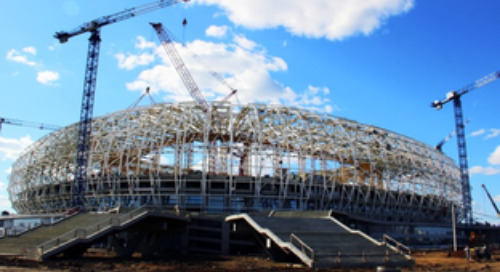 By using BIM, design defects can be eliminated during fabrication and changes made quickly to complex assemblies, such as the Spartak Stadium. "We begin by developing an axial model, then the basic profiles. Already at this stage the customer can see an approximate mass of the steel structure. Next we complete a preliminary development of the units, calculations, and inspect the assembly. In the model, the customer can check that everything is clear. 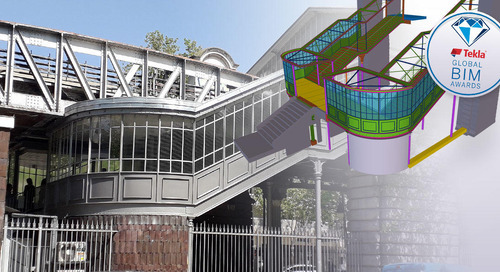 When the drawings are later printed from Tekla Structures, they fully comply with the 3D model." If Kurganstalmost employees are not familiar with Tekla to begin with, according to Raznoglyadov, their first impression is often "wow". They are surprised how the software allows to realize complex geometry and joints and how everything can be viewed real-time on screen. "Integration of Tekla with the HGG pipe-cutting software is simple and easy," says Viktor Sherenkov, Technical Director of Mosproekt OAO. "One of the stadiums we are working on consists of 32 identical sections, and we use tubes of different diameters from 820mm to 426mm. The tubes are welded to one tube from four sides with saddle cuts. In this case, we import the tube to HGG ProCam. First we create a connection of the gusset plates with the two tubes to connect. We select the connection type and the tubes to connect, and that's it, the connection is created." "We need to make the software understand that we will cut in gusset plates. For this, we create an elongated opening. All import happens by pressing one button, and then we select whether to export all tubes or just one. After export, we close and enter HGG ProCAM where we can review the object in a tree structure or in 3D, and check the control length and 2D drawings. The marking is easy to export. Once the tube is imported from Tekla, it is checked in HGG ProCAM, and the file for pipe cutting is created for the HGG machine. To do this, we point to the item and select to create the cutting files. The file for pipe-cutting can, for example, consist of a saddle cut with beveling and grooves." "Our plant fabricates a diverse product line," says Ivan Fedoseev, Deputy Chief Designer, whose department's main task is to provide the documentation. "We produce bridge, building and other unique structures. Our advantage is that we can quickly and without additional training produce the required geometry for construction and select the required drawings. We can develop complex geometric components and structures with less time spent on their drawing specification. Before 3D modeling, we needed additional drawings and geometric calculations." "In addition to Trimble Total Station, we use our own compatible system ManMoS. 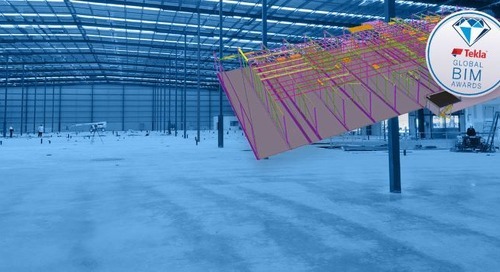 It means that we can shoot the geometry of the structure and show it in the 3D model with Trimble and ManMoS. The equipment at our plant allows to create the file for the CNC machine directly from Tekla to fabricate the part according to the geometry in the 3D model. This reduces the production engineer's workload: now he only creates a file, loads it to the machine, and checks the file parameters." "Another advantage is that we set the curved surface geometry in simplified format," continues Fedoseev. "Our experience has shown that the assembly is virtually 100% correct. In other words, it shows all "tube-on-tube" connections with proper quality, and our equipment even does markup. The worker can directly see the trace where to place the next part for an assembly. Using Trimble and our system ManMoS, we take the part or assembly's unit coordinates and load it into the model. When we open the model, we can see the design and the factual points and can quickly and accurately provide an adjustment solution for installation. This way we can immediately set the control points in the 3D model." "Pipes seem to be an ideal construction solution with less steel consumption yet enough strength," says Vasiliy Tetukov, Deputy of Chief Process Engineer at Kurganstalmost. "The structures are not only beautiful but also profitable for steel constructions. Integration with HGG machinery widens the capabilities of our production, principally our readiness to take orders into production. The machines cut complicated shapes,for example saddle shapes for pipe-to-pipe connections. 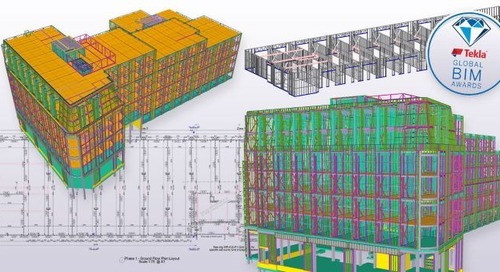 For work preparation and creating programs, we create a model in Tekla Structures, to check the geometry of all parts and guarantee that assembling works." "More and more pipes are used in steel construction," confirms Igor Stennikov, chief of the welding technological bureau. "Before the processes were automated, we did pipe cutting in a more laborious way. When making the selection for equipment, we put focus on the accuracy and quality of cutting." Kurganstalmost JSC is the largest of six enterprises forming the system of Russian joint-stock company Mostostroyindustria of the Transstroy Corporation. The company combines the whole production run from supply of metal to shipment of finished goods. 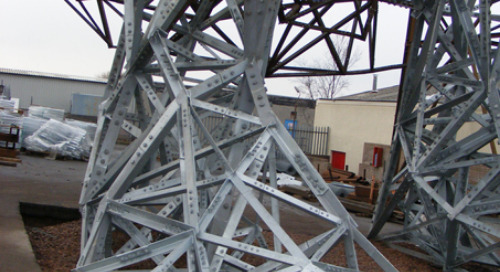 It is specialized in metal superstructures of different purposes, including steel superstructures of bridge spans, metalware, mill-cut steel fibre, large-diameter pipes and drilling-rigs. Currently it is the leading enterprise in its industry in terms of production output, the annual capacity being more than 50,000 tons. Kurganstalmost's products are used in many regions of the Russian Federation as well as in Kazakhstan, Belarus, the Baltic States, Turkey, and Laos, for example. With its engineering, the company has joined the banks of the Dnepr, Pripyat, Kama, Irtysh, Ob, and Belaya rivers. The company applies a QM system that corresponds to the demands of international ISO 9000 standards, holds a certificate of Lloyd’s Register Quality, and possesses a DVC ZERT certificate issued by German Certification Body Deutscher Akkreditiorungs Rat (DAR). HGG is an international company with an extensive network of representatives and partners around the world, with its headquarters located in The Netherlands. HGG is the expert in 3D Profiling, the process of cutting metal profiles for the purpose of forming welded connections. The company’s strength lies in the unique synergy between the two auxiliary business entities. One part of the company focuses on developing and producing customized 3D Profiling machines, while the other performs 3D Profiling services for third parties on the in-house built machines. HGG’s products find wide application in the offshore, ship building, process piping and steel construction industries.